Ashely Magee, DVM, DACVS, describes the case of a golden retriever diagnosed with idiopathic pericardial effusion. The patient’s surgical options, surgical description, and case outcome are discussed. An 11-year-old male neutered golden retriever was referred to Dove Lewis Emergency Animal Hospital for surgical management of idiopathic pericardial effusion. 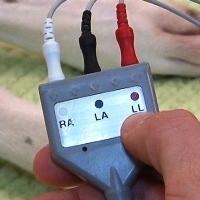 The dog was originally diagnosed in February 2012 (22 months prior to surgery). At that time, pericardiocentesis and full cardiac evaluation was performed with no other abnormalities noted in the echocardiogram or cytology of the fluid. His condition was clinically silent until June 2012, when he responded well to another pericardiocentesis. He was reexamined in December 2013 due to abdominal distension, and pericardial effusion and ascites detected. The ascites (3.4L) was drained, but the pericardial effusion was limited at that time. Unfortunately, the ascites returned along with pleural effusion and an increase in pericardial fluid over the following week. Full diagnostic work-up (three view thoracic radiographs, abdominal ultrasound, echocardiogram, CBC and serum chemistry evaluation) yielded no other significant findings other than tricavitary effusion and associated mild panhypoproteinemia. The pericardial and peritoneal fluid was drained again and surgical intervention in the form of pericardiectomy was recommended in order to relieve his persistent and rapidly worsening clinical signs. The dog’s quality of life was of utmost importance to his family and traditional thoracotomy was not considered an option due to his active outdoor lifestyle as a ranch dog. Therefore, thoracoscopic pericardiectomy was elected due to its minimally invasive nature, rapid recovery time, and effectiveness for resolution of clinical signs in patients with pericardial effusion. A window approximately 4 x 5 cm in diameter was made. The scope was introduced into the pericardial sac and a limited evaluation of its interior and the atria did not reveal further abnormalities. The removed pericardium was saved for biopsy. The thorax was lavaged with warm saline. A 20 French thoracic drainage tube was placed through the subxyphoid instrument portal and secured to the skin. All three portals were closed in three layers using interrupted absorbable suture and skin staples. The thorax was evacuated of residual fluid and air and the dog was moved to ICU for recovery. He was ambulatory within four hours of surgery and eating by eight hours post-op. He was transitioned to oral tramadol over the course of the evening and the fentanyl discontinued. The thoracic drainage tube was removed 24 hours post-operatively and a light chest bandage placed. A residual volume of 1250 ml of ascites was also drained from the abdomen. The dog was monitored in the hospital for another 24 hours post-operatively per the clients’ request then discharged on two weeks of exercise restriction and pain medication, rechecking with his primary care DVM in three days for bandage removal and fourteen days for suture removal. Idiopathic pericardial effusion is considered a common cause of pericardial tapenade, although it is likely that a subset of these patients actually have undiagnosed neoplasia. In this case, histopathology of the removed pericardium was ultimately declined because the clients felt it would not change their decisions regarding the dog’s medical management. This patient’s signalment is typical for affected patients, as golden retrievers are overrepresented in case reviews of the disease, as are older patients.1,-3 While repeated pericardiocentesis can resolve clinical signs for variable periods, often the fluid and associated clinical signs (lethargy, weakness, ascites, hepatomegaly) return, as demonstrated by this dog’s clinical course. Surgical removal of the pericardium (pericardiectomy) can be palliative or often curative for patients with recurrent idiopathic pericardial effusion. Removing part of the pericardium is proposed to improve clinical signs by decreasing the volume of tissue that is available to produce fluid, as well as increasing surface area available to reabsorb fluid by exposing it to the pleural surfaces for resorption, and relieving the effects of right heart compression by fluid. Open thoracotomy allows for a complete pericardiectomy if performed through a median sternotomy, or subtotal pericardiectomy can performed by removing pericardium to the level of the phrenic nerves via an intercostal thoracotomy or transdiaphragmatic approach2. 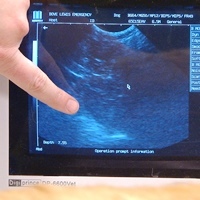 With the laparoscope, either a subtotal or varying degrees of partial pericardiectomy can be performed. Although a recent study found significantly longer survival times in seventeen patients with idiopathic pericardial effusion undergoing open subtotal pericardiectomy (100% survival > 3 yrs.) when compared to thoracoscopic pericardial window (mean survival time 13.1 months or about 400 days)3, thoracoscopic partial pericardiectomy performed in thirteen dogs creating a 4-5 cm window resulted in an average survival time in dogs with neoplastic effusion of 128 days and 617 days in patients with idiopathic effusion2. In this study, however, only 23 percent of the patients had idiopathic pericardial effusion. In this case, while subtotal pericardiectomy was the surgical goal, inability to identify the phrenic nerves in the thickened and inflamed pericardium precluded safe performance of this procedure. The LigaSureTM device used in this procedure for dissection of the mediastinum and excision of the pericardium provides both hemostasis of excised tissue as well as cutting capabilities. It uses radiofrequency energy to permanently seal tissue and vasculature up to 7 mm in diameter. This helps improve visibility by preventing hemorrhage in the operative field, as well as limiting blood and protein loss for the patient. The endoscopic hand pieces have a surgical blade that can be deployed after vessel fusion, allowing coagulation and transection with one instrument, helping to minimize the number of instrument portals needed to perform a procedure and decreasing surgical time. The device uses tissue impedance feedback to control energy output, resulting in precise limiting of thermal spread to several millimeters, thus increasing safety when working in close proximity to vital structures. Potential complications of pericardiectomy include hemorrhage, damage to neurovascular structures, heart or lungs, herniation of the heart through the pericardial window, and eventual reattachment of the pericardium to the heart resulting in return of clinical signs. When planning thoracoscopic procedures the potential need for conversion to an open thoracotomy in case of operative complications should always be discussed with clients and surgical prep performed with this possibility in mind. The surgical goal is always to safely remove as much pericardium as possible, either via a subtotal pericardiectomy or a large window. Benefits of thoracoscopic procedures include avoiding the soft tissue trauma and pain of open procedures, increased visualization of intrathoracic structures via the magnification of the endoscope and camera, more rapid recovery times and less post-operative hospitalization4. This dog recovered rapidly with no recurrence of pericardial, pleural or peritoneal effusion to date and returned to his active outdoor lifestyle. While his long-term survival could still be considered uncertain at 90 days post-op, the thoracoscopic partial pericardiectomy procedure allowed for rapid resolution of life-threatening clinical signs and return to normal activity at home, the primary goal for this patient’s family. Aronsohn, MG, Carpenter, JL. 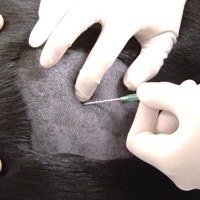 Surgical Treatment of idiopathic pericardial effusion in the dog: 25 cases. J Am Anim Hosp Assoc 1999 Nov-Dec; 35(6): 521-5. Jackson, J, Richter, KP, Launer, DP. 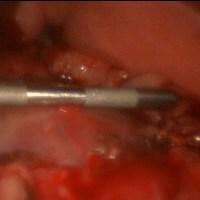 Thoracoscopic partial pericardiectomy in 13 dogs. J Vet Intern Med 1999 Nov-Dec; 13(6): 529-33.